We left Arles in burning bright sunshine, and headed east along the busy Monday morning roads. I was so busy telling you about other stuff, I forgot to mention that now we were up to four punctures and needed some replacement tubes. After slogging along for 10 miles on an arrow straight road next to the motorway, we stopped at an InterSport on the outskirts of Salon de Provence. I skilfully negotiated the price of the aforementioned tubes down from 40 euros to 13, simply by being charming, and going back with all the wrong stuff I'd bought after Dave pointed it out to me. By lunchtime the temperature was hitting 30 degrees and it was getting pretty unpleasant. We stopped for a salad and some ice cream at a cafe, and drank too much water and pop. I've discovered that too much fluid intake can be just as uncomfortable for the body as too little. 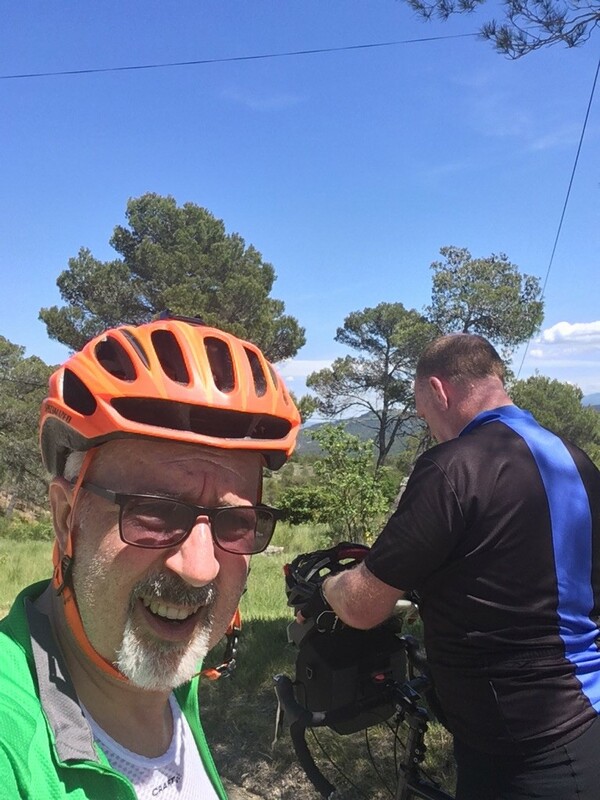 Now we were well into the glorious Provence region, and the hills became steeper and the wind less cooling - and having to stop and pee every 15 miles really got annoying. While I tried a few mid-afternoon big-gear attacks to try and get some distance covered quickly, I was matched mile for mile by Dave. He's so much fitter this trip, and when he needs to get the hammer down it's like a big machine you just can't stop. Allez mon brave! 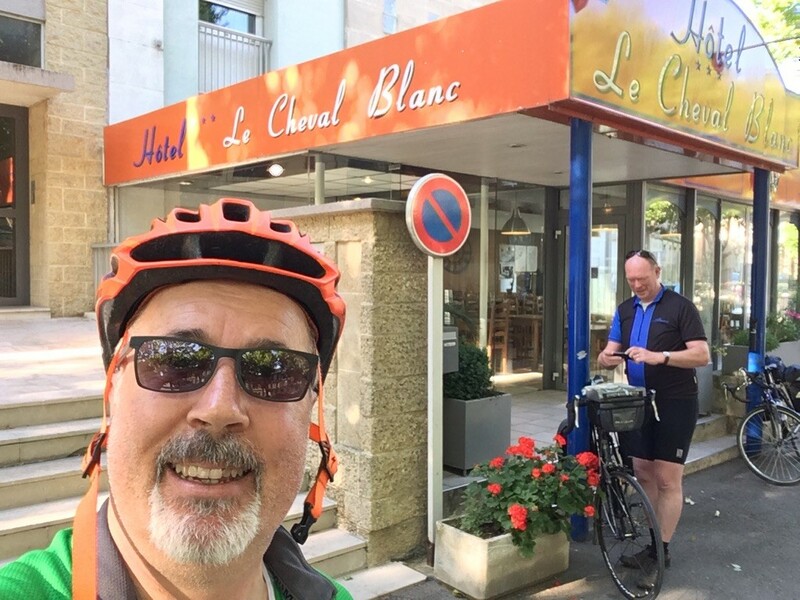 Finally we rolled up into Rians - the sort of Provencial hill town you'd miss if you approached it while tuning the car radio - and checked into the lovely Hotellerie de l'esplinade. Nothing much here has changed in the last 100 years - but the welcome and the beautiful meal we enjoyed tells me it didn't really need to. With talk of the French elections and Brexit echoing through the restaurant as the sun set, we retired happy. Tomorrow's going to be hotter AND hillier.